With the Season 2 premiere of Star Wars Rebels just one day away, LucasFilm has revealed a clip from the first episode, The Lost Commanders. 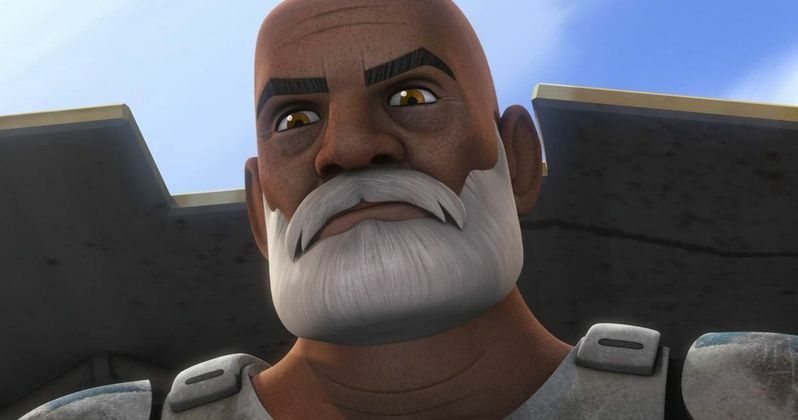 In this scene from Star Wars Rebels, Ezra (Taylor Gray) introduces himself and the rest of his compatriots to the clones, who identify themselves as Captain Rex and Commanders Gregor and Wolffe. The meeting becomes much friendlier when Ezra reveals they were sent by Ahsoka Tano (Ashley Eckstein). Fans of Star Wars: The Clone Wars will remember Captain Rex, Gregor and Wolffe, all of whom are voiced by Dee Bradley Baker. Ahsoka Tano, who debuted in the Star Wars Rebels Season 1 finale Fire Across the Galaxy after six seasons on Star Wars: The Clone Wars. Fans learned that Tano was an early member of the Rebel Alliance. She put her skills as one of the few remaining Jedis to good use, helping to gather the army that would eventually take down the first Death Star. As the second season of Star Wars Rebels opens, the crew of the Ghost is now a very real threat to the Empire. That's bad news, because Darth Vader has been assigned with the task of mopping them up. Undeterred, the rebels seek out old friends and new allies, hoping to rally the formidable alliance which began to crystallize at the end of Season One. Vader will dispatch new agents to counter their growing coalition, but the Sith Lord's battle with the Rebels could be more personal than anyone realized. The talented voice cast includes Freddie Prinze Jr. as Kanan, Vanessa Marshall as Hera, Steve Blum as Zeb, Tiya Sircar as Sabine, Taylor Gray as Ezra, Ashley Eckstein as Ahsoka Tano, Dee Bradley Baker as Captain Rex, Captain Gregor and Commander Wolffe and David Oyelowo as Agent Kallus. Sarah Michelle Gellar will also star in Season 2 as the new Inquisitor known as the Seventh Sister. In addition, the series has brought back a number of classic characters with Stephen Stanton voicing Grand Moff Tarkin, Phil LaMarr as Bail Organa and original trilogy stars Billy Dee Williams (Lando Calrissian), Frank Oz (Yoda) and Anthony Daniels (C-3PO) voicing their characters. Star Wars Rebels is created by Dave Filoni (Star Wars: The Clone Wars), Simon Kinberg (X-Men: Days of Future Past, Sherlock Holmes), and Carrie Beck. The Lucasfilm Animation production is executive-produced by Dave Filoni and Simon Kinberg, and co-executive produced by Henry Gilroy. Check out the latest clip before the Season 2 premiere of Star Wars Rebels debuts tomorrow night.